The relationship between musicality and lyricism is a complex topic as music in itself is a product of expression free from the limitations of language. With maximum self-expression in mind, some musicians are able to avoid words all together and convey their emotion through composition or improvisation. On the other hand, certain songwriters use sound as a way of increasing the impact of their poetic ideas. The lines can also be further blurred by the possibility of writing lyrics pertaining to a more instrumentally-centric work and the display of musical brilliance alongside a more poetic work. The poetic musicality debate is a subject of conversation on No Negative’s December release, The Good Never Comes. A product of the noise punk idiom, The Good Never Comes includes vocal work, however, at times the lyrics can be hard to understand resulting in a more textually important vocal presence. Through their vague use of words and improvisational nature, No Negative are able to effectively display their emotions in a unique way that showcases both their way with words and ability to manipulate sound. The unpredictable instrumental texture is accomplished through the lack of melodic hierarchy. This is to say that rather than letting a single part of the ensemble stand out at moment, the whole group dictates the sound as one entity. The crashing, dark chord progressions are matched by the high-intensity, melodic solo lines as the heavy drums barrel down on the listener in a moment of pure, unadulterated aggression free from the notion that any parts hold a higher significance than any others. This notion is also the inspiration for the vocals which add another layer of melody to the muddy ensemble sound. This whole idea provides for a conversational nature similar to the world of jazz. In both realms, certain motivic ideas are repeated and, at times, the ensemble comes together to maintain some sense of unity, however, the spur-of-the-moment, human touches are prioritized. Although the piece is more of a dive into sound than literature, No Negative use words in a very interesting way. The songs aren’t necessarily cohesive ideas conveyed with a specific verse and chorus structure. Rather, certain glimpses of thematic phrasing make their way out of the abyss to aid the instrumental parts in their quest for musicality. For example, the question “Can You Feel It?” is repeated in parts of Feel It in juxtaposition to the indistinguishable yelling in other areas. By presenting this simple phrase, the vocals come out of the confusion for an effective emotional appeal that adds to the mood created by the instrumental work. The question “Can you feel it?” explains the purpose of the piece in a way. The song aims to manipulate the listener’s feelings rather than present the vocalist’s and the simplicity of this hook provides for a morose rhythmic device. The last song on the record, Crawling into Oblivion, is another example of creativity in regards to lyricism. The piece opens with a spoken word excerpt on the topic of birth which leads into a highly distorted guitar groove. As the song continues, the spoken word returns presenting an ironic self-help seminar underneath the seemingly angry ensemble sound with lines such as “you behave in direct correspondence with the person you believe yourself to be” and “I either gotta learn to dance or I gotta stop…doing a seminar in which I tell people you can do anything you set your mind to” culminating in a deceptively positive final statement; “I believe in you and I believe in your future.” The piece questions the false positives we carry in life as the character encouraging people to accomplish their goals falls into the trap of introspection wondering if he can actually practice what he preaches. The presentation of this theme also maintains No Negative’s improvisational nature as the words are spoken underneath the musical ideas rather than sung as the melodic centrepiece. 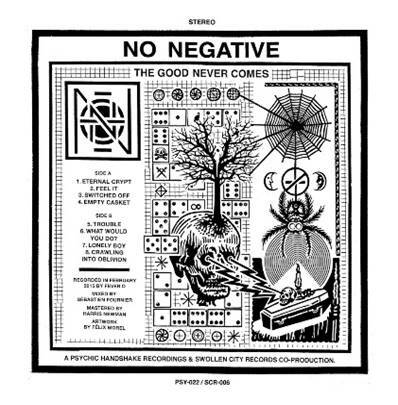 No Negative have truly exposed their knack for both sound and lyricism on The Good Never Comes. At first glance, the album is a gripping piece of noise punk with powerful vocals and shredding guitar solos, but further contemplation on the minimalist lyrics provides for an intriguing level of emotion behind the sound. The open ended instrumental arrangements make for a different experience every time the album is heard due to the independence of each layer and the lack of vocal clarity allows for the band to emphasize their thematic ideas without explaining every detail of the work. This entry was posted in CKUT programming on January 26, 2016 by librarian.